Braj ki Holi is famous world over and undoubtedly the place to be if you are in a mood to experience the authentic loud Holi. Braj, also known as Brij or Brijbhoomi, combines areas of Mathura, the birthplace of Lord Krishna & Vrindavan where he grew up. Also Barsana, Radha’s village where our not-so-fair Krishna playfully put colors on the fair skinned Radha and other gopis! Holi in this part of world is not just a festival, it’s a celebration of life, happiness, love and friendship. Dipped in hues of love and laughter, the celebrations here start a week in advance. 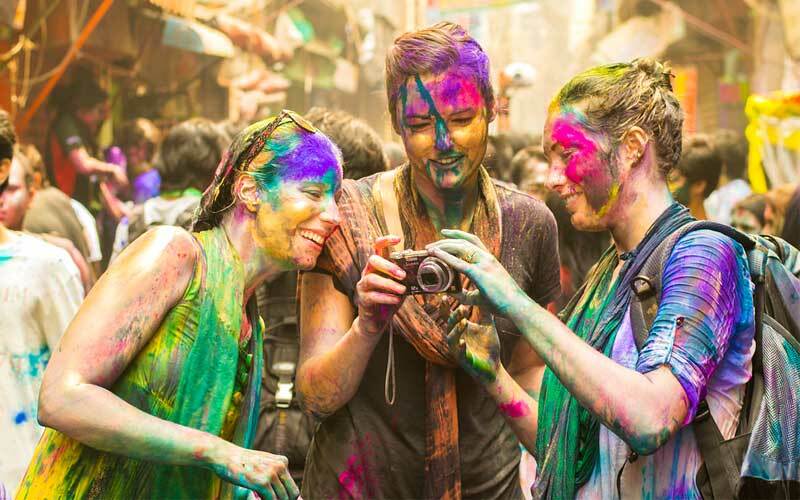 Thousands of Indian and foreign tourists travel to these cities every year to capture the essence of true Holi. The Banke Bihari Temple in Vrindavan is the biggest venue for Holi in here. The “Phoolon wali Holi” (floral holi) hosted a few days before the actual festival is a unique way to celebrate the seasons of colors with floral petals. On the day of the festival, the temple opens its doors to all the visitors, to play Holi with Krishna, here inside the temple premises, a surreal experience. In Mathura, experience Bhaang making at the Ghaats of Ganga by none other than our very own Hindu priests. What fun! The remarkable Dwarkadheesh Temple is the most sought after destination for Holi celebrations in Mathura, coloring any and everyone who dare enter the premises. Saffron is everyone’s favorite color. Don’t forget to capture the Holi procession where little children dressed up as Radhe-Krishna head out on colorfully flower decorated chariots. And if you are up for it, head out on the streets of Barsana to witness some fun filling beatings!! Be the tourist and enjoy these sights from the comforts of your terrace. Lathmar Holi, as the name suggests involves some serious beatings by the local ladies to chase the men away with lathi sticks – a la Radha Gopi style who chased Krishna and his boys away when they visited to tease her for Holi with colors. I’d also recommend you arrive a few days early and stay back a little longer to participate in some of the festivities planned before and after the Holi day. Braj is part of Uttar Pradesh and barely 115 km drive away from New Delhi. It is well connected by trains from Mumbai and all other major Indian cities. This post is a part of #HoliHoppers blog hop hosted by me & my wonderful friends Aesha Shah, Dipika Singh, Ruchi Verma. This awesome blog hop is sponsored by VLCC Beauty Products & Putawan Thailand. The rules are quite simple and we expect participants to take kind note of the same. Please participate only if you can write ONE blog post, engage with other participants, and share the love on social media. Add mandatory text “This post is a part of the #HoliHoppers blog hop hosted by Mandavi , Dipika , Ruchie , Aesha and sponsored by VLCC Beauty Products & Phutawan Thailand” in your post. The prize of 4000 INR for the #HoliHoppers blog hop 4 winners. Each winner will get cash/vouchers worth 1,000 INR. Assured participation gift from VLCC. 2 winners will get skincare hamper from Phutawan Thailand. Linky is open till 28th March 2019. You are free to use the #HoliHoppers creative image attached above. Follow all 4 hosts and both sponsors on all Social Media handles. Tag the hosts and both the sponsors while sharing your own post. Use hashtag #HoliHoppers for us to monitor your engagements. Reading, commenting and sharing on all hosts + 10 posts before you in this blog hop is mandatory. Previous Be mindful when visiting a new mom. Don’t make her hate you. I had just a brief idea of Holi Celebrations in North India but your post makes me want to visit Vrindavan and experience the ‘Phoolowali Holi’. I really want to experience Braj ki Holi at least once. I have heard so much about it. For now I experienced it through your post. Thanks for sharing. I have been just little before Holi to Mathura and Vrindavan and trust me the energy and vibes is totally different. Must experience! Great write up focused on Vrindavan Holi !! It brings out the best of the Vrindavan Holi. I have visited Barsana and Nandgaon during Holi with my family. The sight of Lathmaar Holi was indeed good. Your post has made Braj ki Holi really come alive for me! Hopefully I’ll experience the real deal sometime. That’s a beautiful post, Mandavi and aspirational too. All of these places I want to visit, especially want to experience phoolon ki holi and witness barsana ki lathi wali holi! What a fun Holi post! After reading your post, I would like to visit all these places to experience traditional Holi celebrations. I am from Uttar Pradesh and grown up listening about this wonderful holi celebration in Braj… I really wish to experience this once in my life!! Just reading your post makes me wanna go there. Beautifully written and expressed. The temples in Vrindavan even on regular days have such an infectious quality about them, I cannot imagine how decked up they must be during Holi. After reading your post I really want to have this experience once. I didn’t know about Braj Ki Holi. Great post. Gives a live description of it. I have heard a lot about Braj Ki Holi but never witness this, but it’s my wish to celebrate holi once at this place.